Are you stuck for a cutting put-down, at a loss for a witty riposte, or just plain tongue-tied? 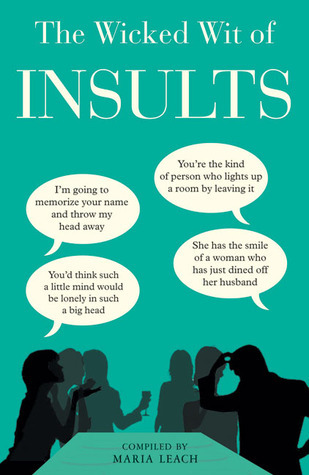 This hilarious compendium of jibes, taunts, and slurs will equip you with a wealth of insults and witty comebacks for every occasion. With an assortment of quotations from great writers, philosophers, actors, and politicians on all subjects from relationships to religion, this book ensures against a lack of derogatory remark or defamatory insult for any situation. I picked this gem from a cool second-hand bookstore in Goa. This is not a book-book…which has a story. This is a collection of extremely witty one liners selected from the best of literature. If you ever find yourself in a situation, where you wish you could have had a nice retort but could never figure out what to say, this book would give you many options. There are various chapters, each chapter focussing on witty lines about a particular topic. These chapters range from relationships to professions. It makes an interesting mix of lines. This is not a book that is to be read in a single shot. If you do that, then you might find yourself getting bored. This is one of those books that you can pick up with you are bored and read a chapter or two to get entertained. I rate this book a perfect 4 out of 4. If you are looking for a book that would keep you entertained, pick this one up.